Hi there, today I have a glitzy card to share with you using gorgeous Cheery Lynn Designs dies along with JustRite Papercraft stamps. Hope you like what you see, so let me tell you how I made it. To start out I die cut two A2 Frames Rectangular Scalloped using black card stock and that was my card base. Than I cut down a A2 Frames Rectangular Classic out of patterned paper to fit on top of my card base. Next I die cut a Coved Rectangle - Scalloped LG Stackers Nesting Dies using cream card stock to fit on top of my patterned paper and inked the edges. Next I die cut the gorgeous brand new Royal Scandinavian Doily Circle out of gold glitter card stock (I am in love with using these nowadays), than die cut a Mirror out of light blue card stock and stamped my sentiment on it using Justrite Papercraft Morning Splendor Clear Stamp set and layered it on top of my doily. Next I die cut a Flourish #6, a Flourish #13 and a Gardenia out of watercolor paper and painted some of them with water color and some I left alone. 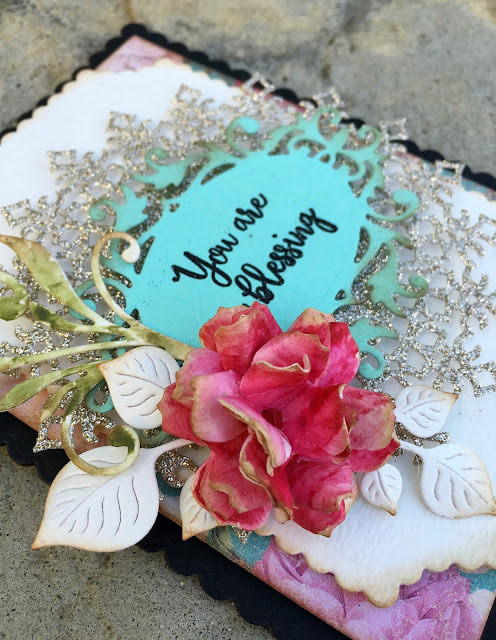 Finally created my flower and added all of them to my card. 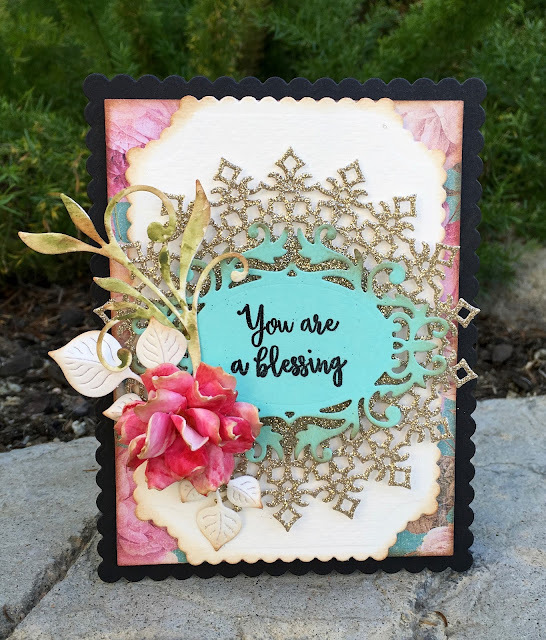 Thanks for stopping by and hope you check out our Cheery Lynn Design's challenge this week and play along!